For me the epitome of spring food - Asparagus. Every year as spring arrives, I impatiently wait as the stores and the Farmer's Market laden their crates and shelves with this delicate vegetable. Funnily enough until a few years ago I hardly ever went for the green sort, but always preferred the white Asparagus, which is actually more widely available in Germany. I think it actually had to do with my memory of the last time I ate green asparagus. It was on an Air France flight to Paris. I was 18 and traveling with my dad. I remember ripping off the sticky aluminum foil from the tray. Inside I was greeted by a musty smell of meat and vegetables and the sight of 3 limp and overcooked asparagus spears. It was not very appetizing to say the least. The look on my dad's face was also one of disappointment. But bravely we both grabbed our forks firmly in our hands and pierced one of the asparagus spears. Just before we opened our mouths we took a quick glance at each other. As if to say "here goes nothing!" Then popped the slightly mushy stick into our mouths. Pushing the tray, still half full, away from us, my dad sipped his whiskey to disinfect his taste buds, I patted down the paper napkin on the tray, in which the remnants of the asparagus spear was hidden. Without exchanging a word both my dad and I started laughing. Although, I still smile at the experience with my dad, there was nothing funny about the bitter and woody taste of asparagus. I did not touch a green asparagus for years after. One spring afternoon in Germany, however, I bought some wonderful vivid green asparagus at the Farmer's Market. At home I prepared a fresh salad and dared to take another go at eating green asparagus. It was nothing compared to the sloppy stick on the flight all those years ago. This was crunchy, nuttier and so full of aroma. The best thing about it was I hardly had any work with it. No peeling, short cooking time and full flavor. Perfect! Green asparagus is the more common variety found in the US and has a more powerful taste. It grows freely in flat beds, and, exposed to the sunlight, develops the chlorophyll that turns it green, giving it the full flavor. White asparagus has a more delicate flavor and tender texture. It is grown underground to inhibit its development of chlorophyll content and therefore gets its distinctive white coloring. White asparagus is very popular in Germany and other European countries. Purple asparagus is much smaller than the green or white variety and has a fruitier flavor. It has higher sugar and lower fibre levels in comparison to the green and white varieties. Asparagus is one of the most nutritionally well-balanced vegetables in existence. They are very low in calories and loaded with vitamins and minerals. A 100g of asparagus have only 24 calories! They are a great source of folic acid, vitamin A, B vitamins and vitamin C and provide a good amount of calcium and fiber to the diet. Asparagus have detoxifying and diuretic effects. The fibers found in asparagus help clean out the gastrointestinal tract. They also help the body get rid of the excess water. Asparagus also contains phytochemical glutathione, which has antioxidant and anticarcinogenic properties. Fresh asparagus should have firm, bright, smooth spears with full, tightly formed heads. When you snap freshly harvested asparagus, it should be crisp, moist and juicy. The ends of the stalks should not be too woody, although a little woodiness prevents the asparagus from drying. Asparagus should be used within a day or two after purchasing, otherwise it starts to loose flavor. Store in the fridge, wrapped in a damp paper towel. Place the asparagus in the back of the refrigerator away from any light, as folate is destroyed by exposure to air, heat or light. Try growing your own asparagus: Easy Gardening for Asparagus gives comprehensive instructions. 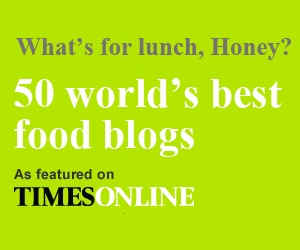 Read my article on the Daily Tiffin about spring food. This dish is simple but simply perfect. The asparagus is drizzled in olive oil, and some lemon juice, sprinkled with salt and pepper and then gently roasted in the oven. Leaves you time to prepare your own sauce Hollandaise. Ideally served with poached eggs and steamed new potatoes. The Prosciutto di Parma (Parma Ham) is entirely optional with this dish. I just enjoy the combination of the ham and the asparagus. 900g asparagus - washed and woody ends cut off. In an large, flat oven proof dish spread out the asparagus. Drizzle with olive oil and lemon juice and sprinkle with salt and pepper. Using your fingers toss well so that the each asparagus spear is coated in the vinaigrette. Place in the oven and gently roast for 15 to 20 minutes. In a pot bring vegetable stock and vinegar to a rolling boil. Keeping the liquid at a good simmer hold a ladle just below the surface of the liquid. Break an egg into the ladle. This allows the egg to keep its form and hinders it from running throughout the pot. Always keep the ladle just below the surface and poach the egg for 3 to 4 minutes. Using a slotted spoon, carefully take the egg out of the simmering stock and place it in a metal bowl filled with luke warm salted water, so that the egg keeps its desired consistency. Cut up the edges of any loose egg white strands to give it a cleaner look. Poach each egg in this manner. For first time poachers: You might find this video from Serious Eats on how to poach an egg very helpful. For a quickie: Poached eggs in a microwave. I've never tried this out myself, but if anyone does please let me know how it worked out. For big gatherings: Something I will definitely try out the next time I have a brunch gathering - Epicurious' Perfect Poached Eggs. The perfectly poached eggs should be soft, with the whites just set and the yolks runny. HMMMNN! I use vegetable stock instead of water as I find it gives it a delectable flavoring. If you prefer you can simply use water and vinegar. Serve the roasted asparagus with a dollop of sauce Hollandaise and poached eggs with steamed new potatoes sprinkled with some fresh herbs or my favorite herb mixture. You can also use white asparagus for this dish, but it requires a little more cleaning and peeling time. Instead of roasting them you can steam them in water with a dash of lemon juice, sugar and salt. Depending on their thickness this might take 20 minutes. For me this is the perfect spring food. Not only because I used asparagus as my spring vegetable, but also because the quick cooking method. Roasting vegetables is perfect. It allows you to sit down and enjoy a glass of chilled wine and the gorgeous warm weather outside. Who wants to spend hours in the kitchen when the glorious weather lures you outside? This is very much the kind of food we enjoy during the warmer months. Light and refreshing, quickly cooked but with a burst of delicate flavors. 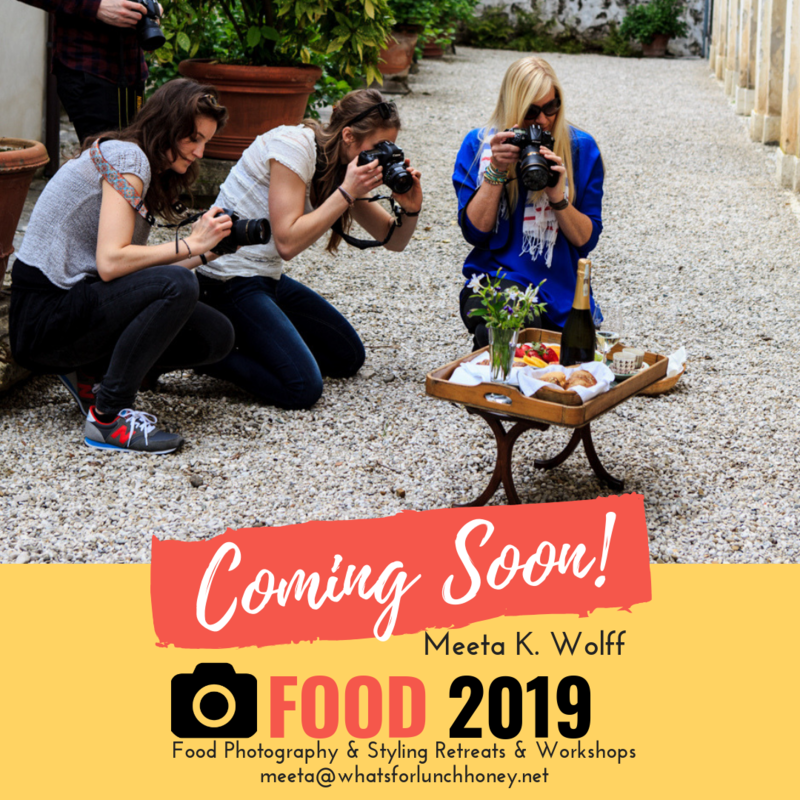 What does your spring food look like? Don't forget your Spring Food for this month's Monthly Mingle. I am so looking forward to your creations. Wow Meeta pic looks so delicious, I love Asparagus and they are abundunt in California, infact attended a yearly asparagus festival last year where you can see Asparagus fritters to Asparagus icecreams, all I can say is this is just one of my favorites when especially tender. how funny - I just had purple (although it's called "pink" here and Italy, where is comes from) last week... very plain, just with melted butter and parmesan. Very nice. Fruitier indeed, but very close to our Austrian (and probably your German) white asparagus. I have always tried Green Asparagus and love it sauteed and drizzled with olive oil and parmesan cheese. Since I have known about its nutritional benefits, I have incorporated it more and more in my food. The perfect way to serve it! Now I Just need to learn how to poach an egg! Oh yes Freya, poached eggs were a mountain too high to climb for me too. I found this cute little ..gadget that does the trick for me! Meeta, I love your combination! 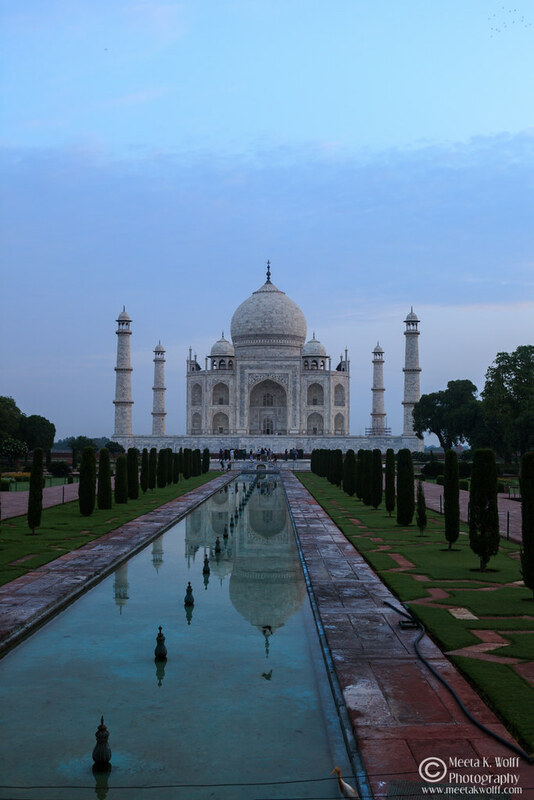 Meeta this is such an informative post that is well structured and chuck full of all the right info. One need not go looking anywhere else for the info on the topic of this post. It takes time and patience to write a post like this and I thank you sincerely for doing so because I know that you are a busy woman. Thanks! 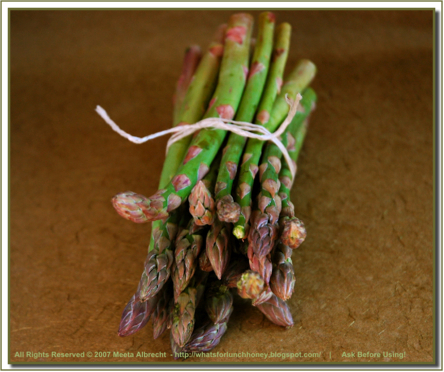 Very nice post... Our asparagus season has long past. But I will remember this for spring! P.S. We have unusually colored produce quite frequently, but I haven't seen purple asparagus (or pink as Johanna mentioned). I'd love to find some though! 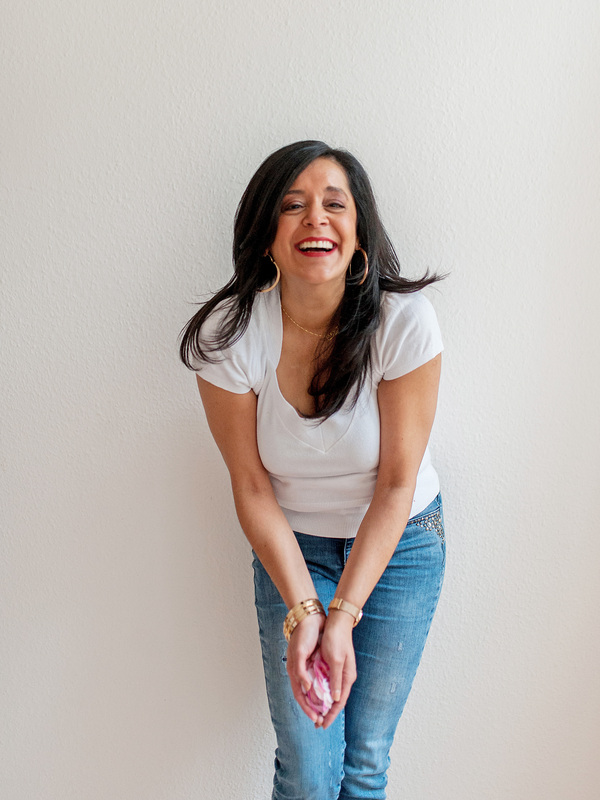 I recently found your blog and felt it necessary to tell you how lovely I think your photography is! I feel so inspired to improve! 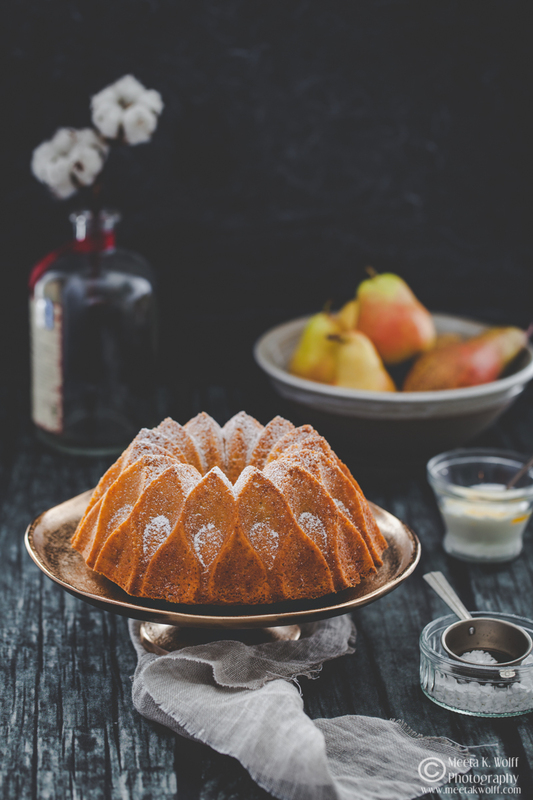 Looks cool, yummy, unique style of cooking. I have tried both green and purple asparagus. Good for heart and brain of our organs. A really wonderful article indeed! I usually saute it, but grilling or even roasting is a great idea. And with creamy and tangy hollandaise sauce, yumm... gorgeous pictures as ever Meeta. Beautiful Meeta! 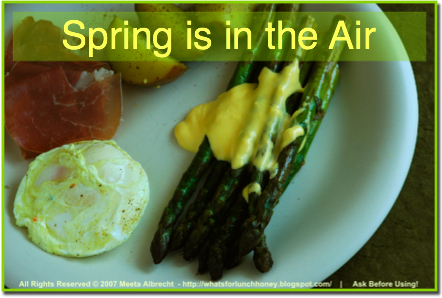 Asparagus is the epitome of spring - and I love eating it with eggs - they seem like a perfect match. I had to laugh at your tale about eating the asparagus with your dad... too cute! ...and I agree the video from Serious Eats is a great primer on poaching eggs. That sounds delicious, the epitome of Spring! Beautiful photos and lots of good information. Poached eggs seems to be a classic addition which I've never gotten around to trying. Maybe this year. The asparagus seem espceially good this year. I really like the way you did the hollandaise in an earlier post and now bring it in here. What a really grand story about your dad!! I have never understood why my mom & dad would keep canned asparagus in the pantry ... I think that must have what I knew of as I was growing up ... wonder why I didn't like asparagus for years. Sreelu, Wow! Asparagus ice cream? Now that is something I need to find a recipe for. Did you taste this? Johanna, I have not seen any purple asparagus here in Germany. Our organic store stocks up on lovely green and white ones, but I think I can ask them to look into it for next season. Sushma, it is healthy and has almost zilch calories. I love it in every way I can make it. Soon Asparagus ice cream too LOL! Freya, no need to be scared of poached eggs. The video is a great help and what I really like is the way they are made in Epicurious. Check those links out. Baking Soda ;-) The gadget link is a dead link. You've gotten me all curious about it now!! Pat, Thanks - yes my dad and I had a few laughs. Cynthia, thanks so much for that feedback. I am never really sure if it too much or too little and try to shorten the details I research according to what I think I would like to read. Anh, Ahh! yes, you on the other side of the world are a tick ahead!! Susan, after seeing your post on the Farmer's market I thought you would have had the pleasure of trying those out. if you do try out the sauce Hollandaise let me know what you thought. Sarah, thank you so much! YOur pics are great too. Bloggerliamaz, thanks! It's also an easy way to prepare it. Mandira, you will love those grilled or roasted. Try it out. Gilly, actually after my dad read this post we chatted for an hour about it. It really brought out more memories. I hope I get a chance to share these. Elle - do try it out with the eggs. You'll just love it. Due to the exceptionally warm winter Asparagus is having a great season. Tanna, eeeeuuhhh! Canned Asparagus? I tried it once and never again. Sig, if you ever do see the other colored ones go ahead and give them a try. I think the health benefit goes out the door when you add the hollandaise...but I'm not one to complain...I love hollandaise. Meeta! A perfect dish to feature spring asparagus. I can't believe I've missed the Mingle again this month. I have to get more organized...but I am geared up for the next one! I just recently started peeling the ends of my asparagus. I had never done it before and thought it was kind of a waste of time but in the end I like the added tenderness. I've been grilling them on the bbq too and then throwing them in salads. Just wonderful. 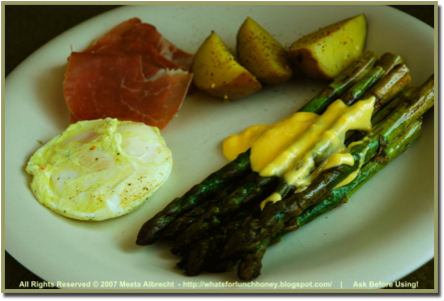 I do think asparagus and hollandaise is the perfect combination. It is a excelent spring treat. Asparagurs is looking good. It is one of my Favarite veggi..... love it. Peabody - A bit of the sauce will not take away all the good things aparagus has to offer. Besides it's just great to indulge every now and then. Esther - Yes I have been missing you! I love them from a BBQ too. Kalyn - thanks. 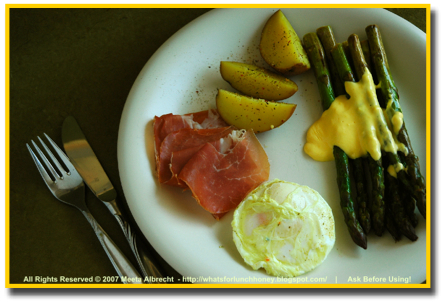 The hollandaise is not perfect for the waistline, but if you eat in every now and then it is a real treat. Sukanya - Thank you. I agree a great treat!